I was so excited to be seeing this magnificant place that despite my long tiring journey and beers with new friends, I was awake at 4am waiting for a Moto (tuk tuk) to take me to the temple. Standing in the dark with a huge famous sillohette just across the water from me I made sure I savoured the memory. Crowds of people were lined along the waters edge, cameras at the ready waiting patiently in the early hours for the sun to rise from behind the temple and reveal its beauty. And it was beautiful. 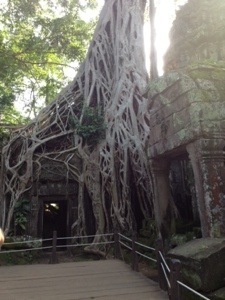 Angkor Wat is now a world heritage site and so there was an entry fee of $20 for a 1 day pass. This gives you a ticket with your photo on and enables you to come and go as you please. Because the city of temples is so vast this is a welcome idea. If you pay a tuk tuk driver about $15 you hire him for the day and so for example you can see Angkor Wat at sunrise, walk around, go back to your hostel for lunch and then head back to see the other temples all at your leisure. 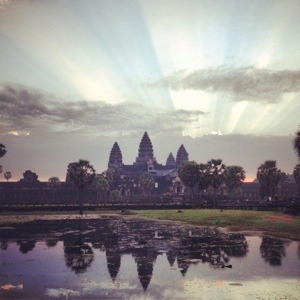 Angkor is one of the most important archaeological sites in Southeast Asia. It extends over approximately 400 square kilometres and although Angkor Wat is the most well known, there are many other amazing temples and structures to see. 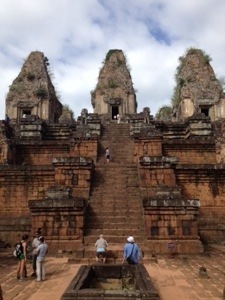 My favourite being the temples that have been overtaken by nature and the setting of a scene from Tomb Raider. 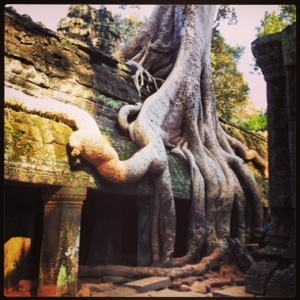 Cambodia is building itself back up following its difficult past and Siem Reap appears to be doing quite well. The awful roads I was once warned about are now easily accessible, although it is clear to see how easily the roads can flood, and the developing towns obviously thrive on tourism. The local people are so friendly, helpful and cheerful and I have instantly become very fond of them. There is still a lot of poverty and this is obvious from the amputees and children begging and selling. It is heartbreaking to see these adorable children who should be at school, sent onto the streets to earn money. A bracelet, a postcard an inscent stick, mean nothing to us but that couple of pence means a lot to them. For 2 nights I stayed at Mad Monkey Hostel which was a great place to stay. In a good location, about 20 minute drive from Angkor Wat, on a main street and close to the bars! It was a lively hostel with clean dorms, a pool, a rooftop bar and was a constant party. Halloween was a fabulous night and it is amazing what costumes backpackers on a budget can create. My favourite was the ‘spring roll’. A girl wrapped herself in cling film and stuffed it with veg from the local market. Brilliant! I purchased some toy guns for $2, got some black tape from a room mate and went as Lara Croft. I was surprised at how much people liked my cheap & cheerful costume. The hostel was fully booked on my third night and so I found another hostel around the corner. I had to pay for a private room and at an expensive $6 I had the privilage of no water whatsoever. I feel sorry for the person sitting next to me on this 6 hour bus journey to Phnom Penh! My first morning in Bangkok I woke up to the loudest thunder, brightest lightening & heaviest rain I have ever heard, but by 12 noon the storm had passed leaving it very hot and humid. A little uncomfortable, but to me this jus adds to the great atmosphere of Bangkok. I had estimated to spend 3 nights in Bangkok but have just booked an extra night here at Napark Hostel. I met a great bunch of people on my first day and its been non-stop since. 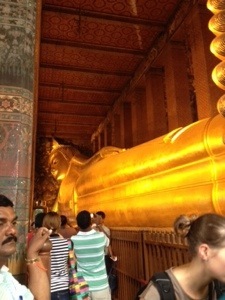 On the first day we walked to Wat Pho which is a beautiful temple in Bangkok and home to the Sleeping Buddha. Entrance fee 100bht. 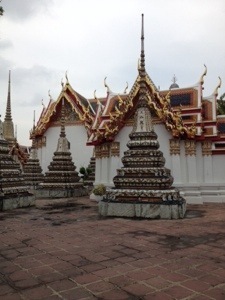 We did originally set out to see the Grand Palace, but got lost and ended up here instead! The following day me and Rachel headed out early to the Umbrella Market and the Floating Market. 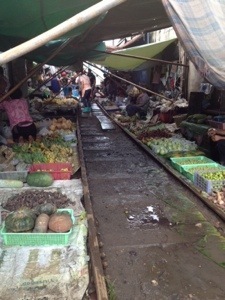 The Umbrella market was unusual to say the least! 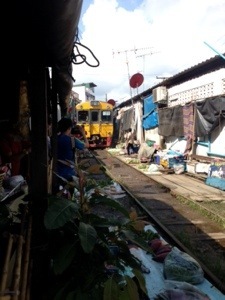 The market traders set up stalls along the rail track and when the train comes they put down their unbrellas until it passes. Of all the places they could set up market, why here, I have still yet to research! 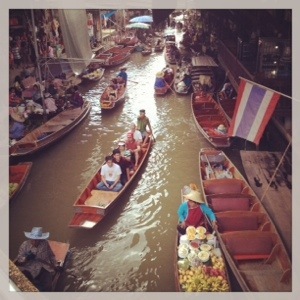 The floating market was another interesting experience, traders trade from their longtail boats on the river and although this an historic market it has now become a tourist trap. But if its helps the Thai people earn money then there is nothing wrong with tourist traps in my opinion. We had to pay an additional 150bht to cruise along the river market, but I was happy to pay this as the experience was one of a kind. This trip cost 350bht. I booked it through a travel agent I came across whilst out walking. Napark Hostel is a brilliant starting point, its safe, clean, friendly and central. A bit more expensive than others but a great place to meet your first set of travel buddies. My first 4 days has been everything I expected and I am really enjoying myself.